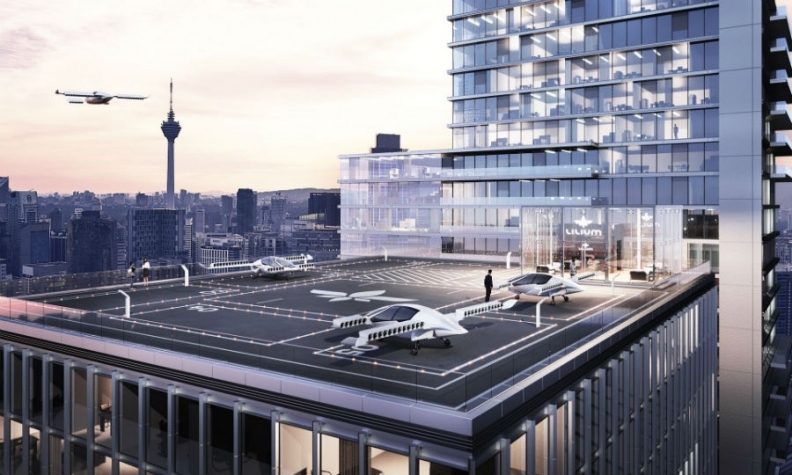 Lilium believes jet taxis could be rapidly adopted in urban areas or between cities with landing pads. PARIS -- With a promise to haul passengers from downtown Manhattan to JFK airport in just five minutes, flying jet taxi designer Lilium raised $90 million from investors including China’s Tencent Holdings. The German startup wants to use the money to build a prototype that can seat five people and fly as fast as 300 kph (186 mph), after its existing two-seater test model had a successful first flight in April, Chief Commercial Officer Remo Gerber said in an interview. Improving the way people get around, and leapfrogging some infrastructure spending in regions including Asia, is part of what attracted Tencent to invest in Lilium, Gerber said. Other backers include LGT Group of Lichtenstein, Twitter co-founder Ev Williams's Obvious Ventures, and UK investor Atomico, bringing the company's total capital raised to more than $100 million. "We think our technology could be rapidly adopted in urban areas or between cities -- all you need is a landing pad," Gerber said. "We're looking for partners who can operate it, at a cost similar to train transport or taxi for passengers." While it's still early days for flying taxis --Gerber estimates it will be several years until Lilium's jet is ready for mass production-- this mode of transportation has attracted investments from Daimler in German startup Volocopter, as well as Airbus, which is backing an automated-flight project called Vahana. Still at prototype phase, these technologies will need some regulatory clearance before commercial deployment happens. Lilium has backing from the European Space Agency. It joins companies such as Italdesign and Seabubbles, a French startup that's designed a flying water taxi, which are exploring solutions to unclog city traffic and make it easier for people to commute. Founded in 2015 by a quartet of academics from the Technical University of Munich, Lilium has hired senior staff from Gett Taxis, Airbus and Tesla. The April test flight program included a mid-air transition from hover mode to wing-borne forward flight. "What you're going to see at this point is a lot of concepts based on different technologies -- drones, planes, others," Gerber said.